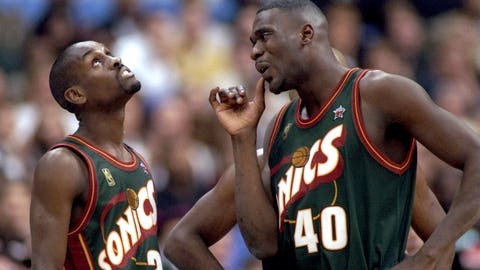 Gary Payton (left) and Shawn Kemp in their glory days with the SuperSonics. 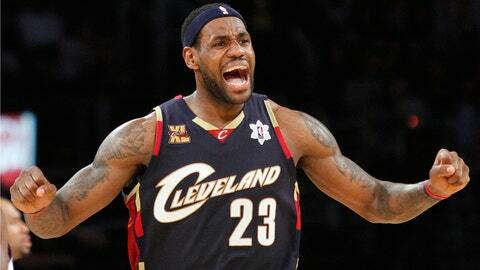 More than any other sport, professional basketball is defined by rings. Get ‘em, and instant respect and historical relevance come with them. Don’t, and regardless of how great you might be individually, your legacy becomes, at least to some degree, hollow. Michael Jordan and the Bulls are as much defined by the six rings they won in the ‘90s as Patrick Ewing and the Knicks are defined by winning zero over a similar stretch. Of course at the same time, to people who really love basketball, the sport isn’t so much about a linear accumulation of statistics as the memories built in the process of getting them. Winning a title may make you immortal in the history books, but being fun, being truly unique, is what makes a player or team unforgettable. No group may better define that maxim than the Seattle SuperSonics of the early and mid-1990s. It was a team that played fun, fast and in your face on both ends of the court, fueled by a pair of stars and coach who weren’t afraid to talk the talk … then went out and backed it up on the court. 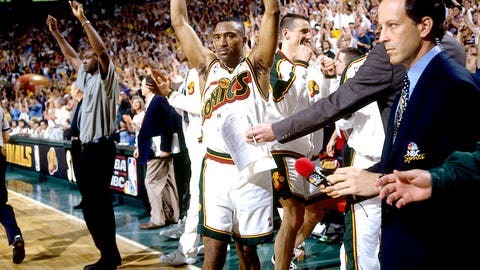 For a stretch of four years from 1993-96, the Sonics were as good as anyone in the West, playing toe-for-toe with, and often beating, the Stockton-Malone Utah Jazz and Hakeem Olajuwon’s Houston Rockets. Those Sonics never won a ring. But in the minds of many, they remain the most vividly memorable Western Conference team of that era. From their wild rise to their run among the best and rapid fall, this is the story of the 1990s Seattle SuperSonics — told through the eyes of the men who lived it. Though there’s a pretty obvious end date to the Sonics’ run as a true NBA title contender, it’s much harder to pin-point an exact start date for their ascent. The obvious choice comes in 1989, when the team had the opportunity to take a franchise-altering big man with the 17th pick in the NBA Draft. 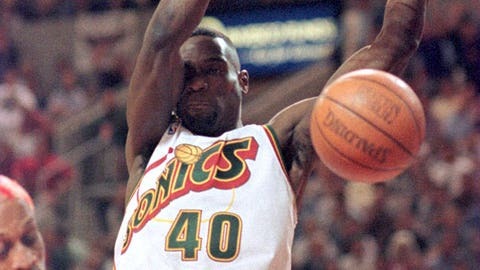 The problem was, no one other than Sonics GM Bob Whitsitt saw Shawn Kemp as franchise-altering. In defense of the owner, coach and everyone else across the league, there was a reason nobody knew anything about Kemp: He had never played a minute of college basketball. Kemp briefly attended Kentucky that fall but was ineligible to play under the old Prop 48 rules. He eventually transferred to a junior college in Texas where he never played, either. That’s also why upon entering the draft Kemp had the backing of virtually no one, despite having the physical skills to match anyone. Whitsitt was one of those people and was immediately sold on a player who he described as “a combination of Dominique Wilkins’ explosive leaping ability, with the power of Charles Barkley.” From the beginning, Whitsitt not only wanted Kemp but knew he needed him. He got his man by striking one of the biggest deals of his career. Only it wasn’t with another team but instead his owner. That’s because, in a season during which the Sonics owned back-to-back picks in the first round, his boss was adamant that the team select a point guard. So with it, Whitsitt made a compromise; with the first pick, he would take that floor general (who ended up being Boston College’s Dana Barros). But with the second, he was going to take the flier on the guy he really wanted, the one who could potentially change the franchise forever. Shawn Kemp was deemed a risky pick by the Sonics. Even if it might one day cost him his job. Therefore, Whitsitt knew the stakes when he selected Kemp. “When I brought in Shawn Kemp I was convinced this was either going to be my grand slam or my strikeout,” he said. Kemp’s first season in Seattle was mostly a success as he earned respect on a veteran team with hard work and relatively quiet demeanor. But as he grew more comfortable in Seattle, Kemp yearned for something more, he yearned for a running mate he could one day terrorize the league with. Whitsitt and his head coach at the time, Bernie Bickerstaff, knew the exact guy. They told Kemp to flip on an Oregon State game that following weekend. That guy was of course Gary Payton, although his arrival in Seattle was hardly as simple as Kemp might make it seem. After the team finished 41-41 that regular season, the Sonics needed some luck simply to end up in the lottery, let alone with Payton. The team lost out on a tie-break for the No. 8 seed in the West, qualifying it for the lottery, but one of its two ping-pong balls somehow popped into the second spot in the draft. After Whitsitt made a deal with New Jersey to ensure the Nets didn’t take Payton with the first overall selection that year (by trading a second-round pick), Seattle had the guy it wanted. The decision also showed incredible foresight on Whitsitt’s behalf. The general manager who was forced to take a point guard the year before took another, choosing to draft the best player available, rather than the one of immediate need. After back-to-back home runs in the first round of the draft, the Sonics had the cornerstones of their franchise for years to come. In my opinion, there was only one guy in that draft who had a chance to be great. That was Gary. Now, they had to find the man to lead them. Following the draft, Kemp and Payton immediately began working out together in Las Vegas, although their first NBA season together hardly went to plan. The team again went 41-41, this time making the playoffs. The Sonics’ season ended with a first-round loss to the No. 1 seed Portland Trail Blazers. Another slow start in the 1991-92 season had many wondering about the direction of the franchise. Payton specifically was struggling, although years later he admitted it was no one’s fault but his own. “I always thought that I could just glide through my skills,” he said. At the time of his hiring, George Karl was just past his 40th birthday, yet was already seen as a pariah by many in the NBA. He was a man known for improving teams and burning bridges with both management and owners. By the time Seattle went looking for a coach in 1992 Karl had already worn through two NBA head jobs and was working in Spain. “My whole time in Europe I was definitely wondering why I wasn’t in the NBA, worried I’d never get back,” he said. In the eyes of most, he never would. To those in the NBA, Karl — a man who now has 1,131 career wins — was unhireable. Never one to run from a challenge, Whitsitt reached out to Karl anyway. The Sonics GM was impressed by Karl’s success regardless of circumstance; his ability to coach in Spain despite not speaking the language; and in the CBA, where rosters fluctuate by the day, and at times, the hour. 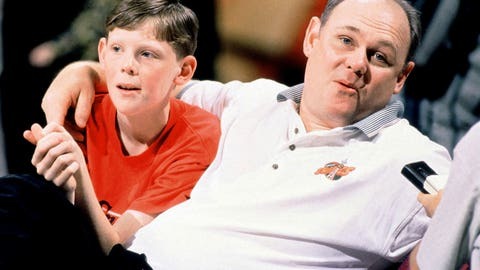 George Karl and son Coby in 1996 at Key Arena in Seattle. By the middle of the 1991-92 season, George Karl was the new head coach of the Seattle SuperSonics. He brought a fast-paced, defensive-oriented style of play that delighted fans. He also brought the attitude he had been known for, much to the disappointment of the players. The feeling was mutual for the new coach and his young player. While that was probably the most colorful dust-up between player and coach, the relationship very nearly did come to a boiling point in Karl’s early time in Seattle. The Mavericks offered to trade Derek Harper for Payton straight up, and in one of the NBA’s great ‘what-if’ moments, the organization nearly accepted. Karl was on board, and just about everyone was, too. In a memorable board-room rant, Whitsitt threatened to let go of everyone in the organization except Payton, if they were unable to develop him into the player most believed he could be. 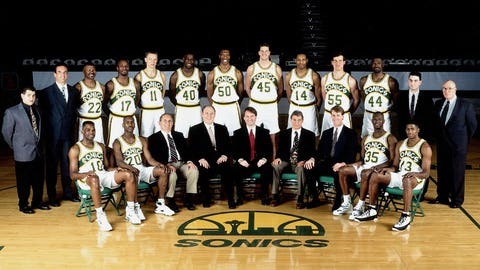 The GM eventually squashed the trade, but more importantly set a new tone within the organization: Love ‘em or hate ‘em, this was the group the Sonics were riding with. Everybody needed to get on-board, or get out. I remember ripping a sink out of a wall one time I was so mad (at Payton). As Payton and Karl slowly built a relationship, Seattle improved in the win column. The Sonics went on to make the playoffs, eventually upsetting Karl’s former team, the Golden State Warriors, in the opening round. And although they lost to the Utah Jazz in Round 2, respect had been earned by both players and coach. Karl set the bar for what was to come. “He challenged us to come back better,” Kemp said. With a taste of postseason success, Kemp and Payton wanted more, and when they arrived in Las Vegas to train that summer, they did so with one stated goal: Get into the best shape of any superstars in the league. When training camp started the next season, their assault on the league began. It happened, though, for a different reason than most think. Kemp, though, was more than just a dunker. Thanks to both the talent of their young players and the aggressive, trapping defensive style implemented by Karl, the team surprised many with 55 wins and the No. 3 seed in the playoffs. They eventually lost to Charles Barkley’s Phoenix Suns in the 1993 Western Conference finals, but there was no doubt the organization was on the rise and that its two superstars were established. In the offseason, Whitsitt (in his final year as GM) continued to tinker with the roster and put the pieces around Payton and Kemp to make the Sonics complete. With acquisitions for Detlef Schrempf and Sam Perkins, as well as the continued evolution of veterans such as Nate McMillan, Karl felt the team could play with anyone by 1994. They were indeed a spectacular team, the best in the West with 63 wins in 1993-94. Unfortunately, once the playoffs came around it was a different story altogether, as the two things that made the Sonics in the regular season — defense and chemistry — abandoned them in the postseason. The 1993-94 SuperSonics were starting to come of age. All of it led to spectacular flameouts in back-to-back postseasons. Seattle became the first No. 1 seed to ever lose to a No. 8 in 1994, the image of Dikembe Mutombo laying on the ground squeezing a basketball one of the most iconic in NBA history. Things weren’t better in 1995, when an up-and-down season again ended with a first-round loss, this time to the Lakers. Whitsitt “resigned” following the stunning 1994 playoff loss, and many wondered how much longer Karl had after the opening-round loss in 1995. A potential Western Conference dynasty appeared to be over before it ever began. In the annals of NBA history, Hersey Hawkins is hardly a name you’d cite as one that was key to an NBA Finals run. Only on a team that continued to tinker around its superstars, Hawkins was exactly what the 1995-96 Sonics needed. He also calmed the team down on the floor and provided the balance of scoring and defense mixed with a blend of selflessness it needed. “I didn’t know a guy who could shoot the ball like that could be such an unselfish player,” Kemp said. Hawkins finally gave Seattle the proper balance of veterans and youth, star power and content role players. In 1995-96, for the second time in three years, the team finished with the West’s best record. It then put its playoff demons to rest for good. 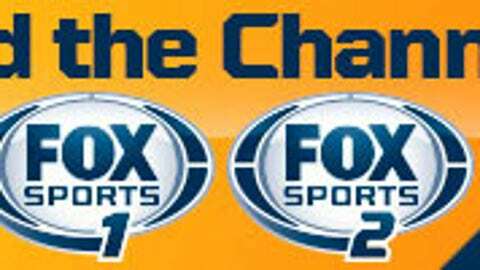 Seattle beat Sacramento in the first round and swept the two-time defending NBA champion Rockets in Round 2. Hersey Hawkins was the missing link. For the first time since the surprising Sonics made a run in the 1993 Western Conference finals, Seattle could see the light at the end of the NBA Finals tunnel. One team stood in its way, the one which always seemed to give it trouble. Though history remembers the Sonics’ matchup with the Bulls in the NBA Finals that season, what many forget is that it was the Jazz as much as any team that gave the Sonics fits in that era. In addition to Chicago, the Jazz were the team the Sonics simply couldn’t overwhelm with defensive pressure. Try too hard to trap them, and Stockton would hit someone for an easy lay-up. Play off Malone, and he’d hit a 15-foot dagger in your face. And it was that clash of style and culture, relative youth vs. veteran, flash vs. poise, that made the 1996 Western Conference finals one of the most memorable ever. The Sonics won the first two games and took a 3-1 series lead before Utah bounced back to win two more and force a Game 7. Even then, the series came down to just a few free throws. Kemp hit a couple with seconds to go in the final game to pull out a victory. With the win, Seattle seemed to have finally, mercifully, fulfilled its potential as a true NBA title contender. The one thing standing between it and holding the Larry O’Brien Trophy was Chicago. To make matters worse, this wasn’t any old incarnation of the Bulls, instead it probably was the best team Phil Jackson and Jerry Krause put together. Chicago won an NBA-record 72 games that season and with Michael Jordan, Scottie Pippen and Dennis Rodman, was the only team in the league that could match Seattle both offensively and defensively. That’s not to say the Sonics were afraid. Though Payton did not fear Jordan, Seattle’s star guard — and that year’s Defensive Player of the Year — was less than 100 percent after suffering a hamstring injury in the previous round. Karl elected to start the series by rotating several players — not including Payton — on Jordan. It proved to be a costly mistake as the Bulls won the first three games of the series. Once Payton did defend him, though, Jordan went on to have the worst game of his Finals career to that point (6 for 19 in Game 4) as the Sonics won not only Game 4 but Game 5 as well. The Bulls eventually did clinch in Game 6, although even then, it was due more to their defense than anything they did offensively. Payton again held Jordan to a quiet night (5 of 19 from the field for 22 points), but it was Rodman’s 19 boards that were the difference. Chicago had its fourth title in six years, but at the time, many thought it had an emerging adversary in the West. Seattle finished with a West-best 64 wins that season and had two All-Stars firmly in their prime and a group of players around Kemp and Payton who perfectly complimented their games. It should’ve been the start of an extended run atop the standings. Little did anyone know that the team would be blown up within a year. Ironically, the start of the Sonics’ fall began when the team solved a huge problem internally. The solution to that problem came when Seattle signed free-agent center Jim McIlvaine to a five-year deal worth more than $30 million. Though Kemp appreciated the help, it caused friction for the All-Star, who was now making less money than a guy who never averaged more than seven points a game in his career. Kemp had signed a long-term deal, and the new management team — Whitsitt had been fired a few years earlier — had no intention of upgrading it. Kemp wanted what he believed was his fair market value and quickly became frustrated — not by the dollars, but by the senselessness of it all. “Jim McIlvaine is a good person and we’re still good friends,” Kemp said. “But to bring in a guy who only averages four or five points a game and pay him more money than your guy that’s leading you to the championship series, it makes no sense. It’s just a ruthless move to make. And it was that respect — or lack thereof — that would ultimately cost Seattle a shot at the dynasty. On paper, the 1996-97 SuperSonics weren’t all that much different than the teams before them, including the one that had gone to the NBA Finals the year before. But on the court it was a different story. The team went on to lose in the second round of the playoffs and Kemp was eventually traded before the start of the next season. The new personnel in the front office never did build a connection with the players and coaches on the floor. Whitsitt himself is adamant the situation would’ve never happened on his watch. To Seattle’s credit, in return for Kemp it did get a solid package of players, one that included All-Star Vin Baker. But Baker wasn’t Kemp, and with Kemp’s departure, the era of run-and-gun, defensive pressure basketball was over in Seattle. Karl left for Milwaukee following the 1997-98 season and Payton joined him with the Bucks in 2003. The Sonics themselves left Seattle for Oklahoma City five years after that. It has been nearly two decades since the Seattle SuperSonics made a run to the 1996 NBA Finals, and all the key pieces agree on one thing: If only they had more time together, they could’ve done something special. It’s a statement Kemp is sure of. Kemp’s former running mate not only agrees but also believes Kemp’s entire career would’ve turned out differently if they had remained teammates. We’ll never know, and are instead left to remember Payton and Kemp through their memories of that special moment in time, through the memories of the fans who adored them, and through clips that have since been uploaded to YouTube. I think we would’ve maybe figured out how to get it done (win a championship). The 1990s Seattle SuperSonics played fast, high-flying and aggressive, relentless on both the offensive and defensive ends. Most of all, they were fun. To the fans who watched, and to the guys who lived it. Those Sonics teams may not be immortal. But to those who watched them, they are unforgettable.